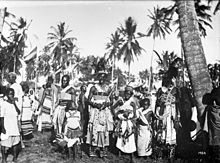 The Zaramo people, also referred to as Dzalamo or Saramo, are an East African ethnic group found along the coast of Tanzania, particularly in its Pwani Region. They are the largest ethnic group in and around Dar es Salaam, the capital of Tanzania. Estimated to be about 0.7 million, over 98% of them are Muslims, more specifically the Shafi'i school of Sunni Islam. Their original language is the Zaramo language, a Bantu language belonging to the Niger-Congo family of languages. However, in contemporary Tanzania, only a few speak it, and most now speak another Bantu language namely Swahili language as their first language, and have adopted Swahili-Arabic names. The term Zaramo, in scholarly studies, also reflects a macro-ethnic group. The larger Zaramo group consists of Zaramo proper but, however includes a number of related peoples such as the Kaguru, Kwere, Kutu, Kami, Sagara, Luguru, Ngulu and Vidunda peoples. The Zaramo society has been historically victimized by slave raids and slave trading by the Swahili-Arab traders of Zanzibar. To resist this persecution, they developed stockade-fortified villages. Many just ran away from the coast, and would return during the day time to farm and fish. Zanzibar Arabs, state William Worger, Nancy Clark and Edward Alpers, however pursued their slave raiding into the mainland, where they would seize pagan Zaramo adults and children, gag them so they would not cry out, and then sell them to the traders. Sometimes during famines, such as in the 19th-century rule of Barghash bin Said of Zanzibar, desperate Zaramo people pawned and sold each other to survive. The Zaramo society's history has long been influenced by the coastal encounter between the Arab-Persian and African populations typical of East Africa, since the 8th century. During the colonial era, the influence came from the encounter between the African people, Arab-Swahili trader intermediaries and the European powers, but it broadly coopted the older slave-driven, social stratification model. According to Elke Stockreiter – a professor of History specializing on Africa, the slaves seized from Zaramo people and other ethnic groups such as Yao, Makonde and Nyamwezi peoples from the mainland and brought to the coastal Tanzania region and Zanzibar sought social inclusion and attempted to reduce their treatment as inferiors by their slave owners by adopting and adapting to Islam in the 19th century. Conversion to Islam among the coastal Zaramo people began in the 19th century. These historic events, states Stockreiter, have influenced the politics and inter-ethnic relations in 20th-century Tanzania. The Zaramo people have adopted the Swahili–Arab culture in terms of dress such as wearing a skull cap, Islamic festivals and Muslim observances, but they continue some of their pre-Islam traditions such as matrilineal kinship, while a few pursue the Kolelo fertility cult and the worship of their ancient deity Mulungu. The traditional practice of Mganga or medicine man, along with Muslim clerics offering services as divine healers, remains popular among the impoverished Zaramo communities. The Zaramo people are settled farmers who also keep livestock and fish, but they also are migrant workers to Tanzania's capital city and tourist sites. They live in Pangone or shanty clusters of villages. They produce staple foods such as rice, millet and sorghum, cassava, as well as cash crops such as coconuts and horticulture produce such as peas. ^ a b c d e Anthony Appiah; Henry Louis Gates (2010). Encyclopedia of Africa. Oxford University Press. p. 572. ISBN 978-0-19-533770-9. ^ Lloyd W. Swantz (1990). The Medicine Man Among the Zaramo of Dar Es Salaam. Nordic Africa Institute. pp. 7–8. ISBN 978-91-7106-299-4. ^ Randall L. Pouwels (2002). Horn and Crescent: Cultural Change and Traditional Islam on the East African Coast, 800-1900. Cambridge University Press. pp. 116–122. ISBN 978-0-521-52309-7. ^ a b c d e James Stuart Olson (1996). The Peoples of Africa: An Ethnohistorical Dictionary. Greenwood Publishing. p. 610. ISBN 978-0-313-27918-8. ^ a b c d William H. Worger; Nancy L. Clark; Edward A. Alpers (2010). Africa and the West: From the slave trade to conquest, 1441-1905. Oxford University Press. pp. 119–120. ISBN 978-0-19-537348-6. ^ Gwyn Campbell (2015). Bonded Labour and Debt in the Indian Ocean World. Routledge. pp. 35–37. ISBN 978-1-317-32008-1. ^ Bernard Calas (2010). From Dar Es Salaam to Bongoland: Urban Mutations in Tanzania. African Books Collective. pp. 173–175. ISBN 978-9987-08-094-6. ^ Bernard Calas (2010). From Dar Es Salaam to Bongoland: Urban Mutations in Tanzania. African Books Collective. pp. 176–178. ISBN 978-9987-08-094-6. ^ a b Elke Stockreiter (2015). Islamic Law, Gender and Social Change in Post-Abolition Zanzibar. Cambridge University Press. pp. 210–212. ISBN 978-1-107-04841-6. ^ Nehemia Levtzion; Randall Pouwels (2000). The History of Islam in Africa. Ohio University Press. pp. 283–284. ISBN 978-0-8214-4461-0. ^ Crawford Young (1979). The Politics of Cultural Pluralism. Univ of Wisconsin Press. pp. 241–242. ISBN 978-0-299-06744-1. ^ Lloyd W. Swantz (1990). The Medicine Man Among the Zaramo of Dar Es Salaam. Nordic Africa Institute. pp. 11–12, 16–17, 24–25, 43–46. ISBN 978-91-7106-299-4.